Reincorporating in low-tax havens like Bermuda, the Cayman Islands or Ireland — known as “inversions” — has been going on for decades. But as regulation has made the process more onerous over the years, companies can no longer simply open a new office abroad or move to a country where they already do substantial business. Instead, most inversions today are achieved through multibillion-dollar cross-border mergers and acquisitions. Robert Willens, a corporate tax adviser, estimates there have been about 50 inversions over all. Of those, 20 occurred in the last year and a half, and most of those were done through mergers. Some other recent corporate inversions include Aon, which moved from Chicago to London in 2012, and Ensco PLC, which moved from Dallas to London in 2009. In addition to Ensco PLC, a slew of oil and gas companies moved abroad over the last 15 years, including Nabors Industries, Halliburton, Foster Wheeler, Noble Corporation, Transocean, Rowan Companies, and Weatherfield International. If not moving abroad, many U.S. businesses have been moving to the individual tax code, where they are taxed once on profits that are passed-through to owners, rather than twice through the corporate tax and shareholder taxes. The end result is there are now fewer corporations than at any time since the 1970s. The chart below shows standard C corporations peaked in 1986 at 2.6 million, and declined to 1.8 million as of 2008, according to the IRS. 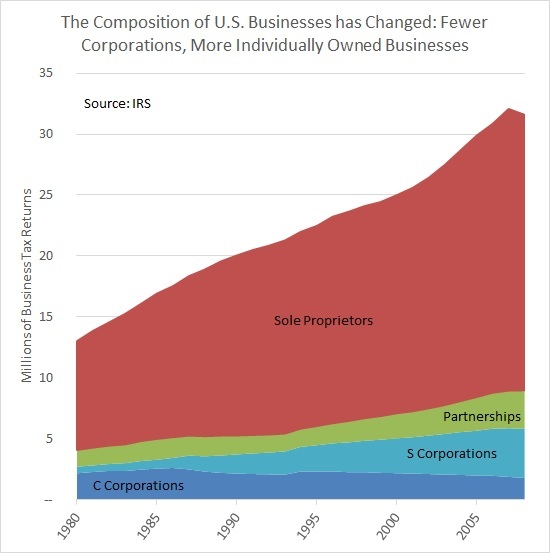 Preliminary IRS data indicates the number of C corporations dropped further to 1.6 million as of 2010. The trend shows no sign of slowing down. It calls into question the notion of “revenue-neutral” corporate tax reform. How can we expect fewer and fewer corporations to generate the same amount of tax revenue? Shouldn’t we be more concerned about the decline of the corporate sector, and the decline of corporate investment?